This recipe is slightly more of a stretch than I usually indulge in, but I really like pretzels, and they’re so easy to make at home. The addition of some darker flours, such as rye and pumpernickel, tweak the pretzels into something just slightly different than we are used to. Cook’s Notes: Although this recipe calls for several types of flour, you can also use plain, unbleached flour as a substitute for the quirkier varieties. This will result in a more American style plain pretzel, which is also delicious with a dusting of salt and some mustard, but lacks that slight otherworldly element of the recipe below. Mix together the water, yeast, sugar, and a cup of the flour. Add the salt, and continue to add flour until the dough has come together into a nice workable, mostly unsticky consistency. Turn dough out onto a lightly floured surface, and knead for several minutes, until the dough bounces back when poked. Place in a greased bowl, cover with a dish towel, and let rise until doubled in size, around 2 hours. Divide the dough into around 16 pieces. Roll each of these into a long, thin rope about 1/2″ thick, and about a foot long. 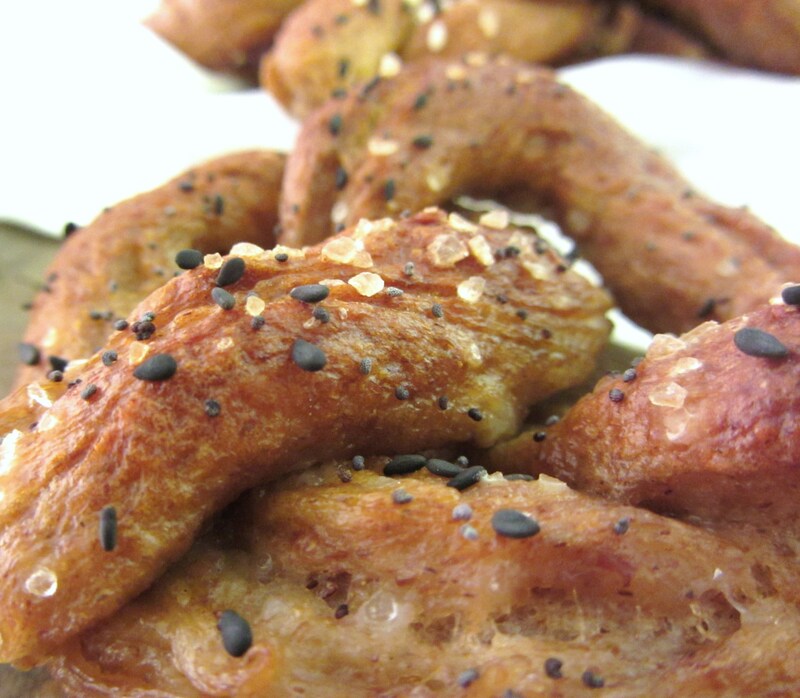 Twist into pretzel shapes, or into whatever shape you like, and set aside to rest. Repeat with all the dough. Line a baking sheet with parchment paper and preheat the oven to 450F. Bring the water and baking soda to a simmer in a medium saucepan. Gently lower several pretzels into this water bath. They should sink to the bottom, but then gradually float up. Allow to simmer for about 30 seconds on each side, flipping half way through. Lift out and allow to drain on a cooling rack. Sprinkle with toppings while the dipped pretzels are still wet, and arrange on the prepared baking sheet. Bake for around 12 minutes, or until the pretzels are a beautiful rich brown color. In the bowl of a stand mixer, combine yeast and warm water. When yeast is foamy, add sugar, rye flavor, and salt. Add flours, 1 cup at a time, mixing the dough in between additions. Once all flour is added, dough will be slightly sticky and pull away from the sides of the mixing bowl. Place the dough in a lightly greased bowl, cover the bowl, and let the dough rise until it’s doubled in bulk, about 1 1/2 hours. Preheat the oven to 450°F. Line two baking sheets with parchment paper and spray with cooking spray. Start heating the water to a boil. Deflate the dough, kneading it briefly to expel any air bubbles. Divide it into 16 pieces if making traditional pretzel knots, otherwise separate as needed for shaping. To make knots, roll each piece as desired each piece into an 18″ rope about 1/2″ in diameter. Take each rope and make a loop with fairly short ends. Fold the loop over the ends to form the traditional pretzel shape. You can also form pretzel rolls by kneading a ball of dough into a bun like shape and allowing it to rest. By the time you’ve formed all the pretzels, the water should be boiling. Turn it down to a simmer, and add the baking soda. Carefully pick up each pretzel and slide it into the water, cooking about four at a time. Make sure there’s plenty of room between them; the pretzels will expand quickly and dramatically. Simmer pretzels for about 2 minutes, flip them over, and simmer for another minute. Use a spatula or slotted spoon to transfer the pretzels to a rack to drain, sprinkling with topping immediately after removing from the water bath. Place the topped pretzels on the prepared baking sheets. Bake them for 12 to 15 minutes, until well browned. Remove from the oven, and serve warm. it’s been ages since I made pretzels, and I’ve been meaning to do some experimenting with different kinds of flours, so this is beyond perfect!